You’ve caught fish in some pretty amazing places. Chesapeake Bay, Potomic River, Leech Lake—Keeping all the “fish stories” straight can be downright confusing. You know, keeping track of all those good times. And, if Snakehead has his way, you won’t have to suffer under this terrible burden any longer. 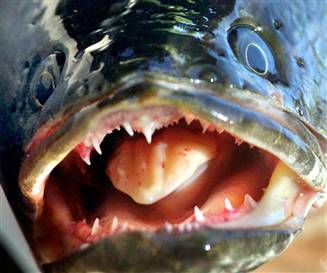 Scientists hanging out in the Rhode River, just south of Annapolis, recently discovered a horrifying, teeth-filled, and downright ugly Northern Snakehead. Did we mention it was egg-bearing female? 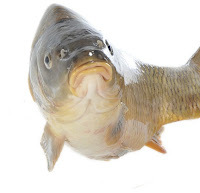 Oh Carp! The Baltimore Sun - Candus Thomson - July 18, 2011 - The 23-inch snakehead was found in the Rhode River last Thursday by biologists from the Smithsonian Environmental Research Center taking annual fish samples by net. "The water was very murky with a lot of sediment. When a fish is that large, you assume it's a carp," said Stacey Havard, a Smithsonian biologist. "An intern saw the pattern and almost instantly identified it." The center tested the fish and reported the catch to the Department of Natural Resources and the U.S. Fish and Wildlife Service. The toothy alien, a native of Asia, is an aggressive, rapidly breeding predator that can overwhelm habitat and push out local fish. Hi Winston, where did you get that picture? Winston is the founder and creator of Bob Lake’s dream, and is a 16-year marketing and branding guru. Recent positions have included director of communications and marketing for Opus Corporation, director of community relations of Lawson Software, and manager-buyer at Nordstrom (love that company). Winston has three awesome children, that when they are not exploring the world, they’re providing design ideas for Bob Lake. She enjoys the outdoors and is a zealot when it comes to protecting our water habitats. When Winston has free time (meaning, self imposed time-outs) she enjoys hanging at a beach, boating and cooking. Of course eating goes along with the cooking.